This is a suite of 9 creative problem solving tools from Erik op ten Berg. He’s an expert in creative thinking or applying creativity from the Netherlands. He’s been working in this field for 25 years and has a Master of Science from Buffalo State University in New York. His creative problem solving process takes a challenge and finds ideas that are new, useful and meaningful. I guarantee you this process will help you mobilise your group’s creative thinking skills. You and your group will find original ideas which are always there. This helps you get to the holy grail of breakthrough thinking and quite possibly the ‘next big thing’. Watch this video to see Erik describe in detail how each tool / activity works with examples. Please note that the video and audio quality is a little shaky in places. Sorry about that! We had some technical issues with Skype that were difficult to overcome. 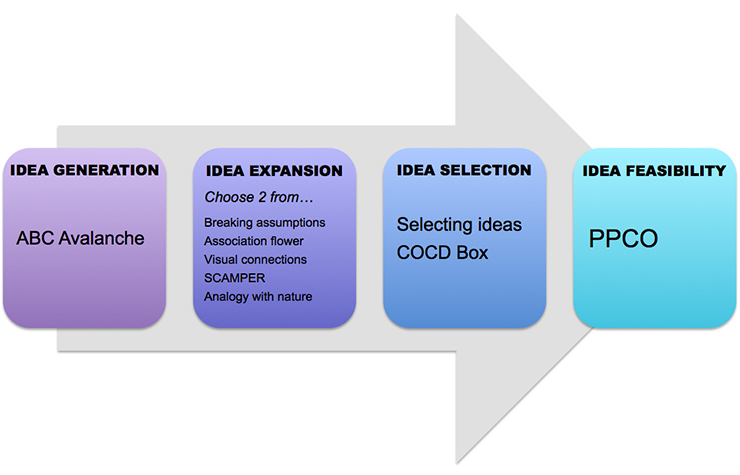 The first two stages help you and your group ‘explore ideas’. The third stage helps you select the best ideas and the fourth tests the feasibility of your best ideas. Always start with the ABC Avalanche and then use 1 or 2 of the next 5 tools to expand the list of possible solutions. A very basic brainstorming technique but extremely powerful. This tool asks people to generate at least 26 ideas for a specific challenge sorting them by their first letters. It takes about 10-15 minutes. Write down the central question. Write down the letters of the alphabet. Generate many ideas sorting them by their first letters. Because participants focus on generating a specific number of ideas they postpone their judgments. Moving past the first few (obvious) ideas. Depending on the number of people in the session you can split into sub-groups. Feel free to build in a little competition between the groups if you like. From this stage you have at least 26 starting ideas and people won’t have jumped into judging whether they are good ideas or not. This is a second stage to an ABC Avalanche. One of the very classical thinking techniques because to be truly creative you need to break patterns. Once you’re aware of a pattern or an assumption in your idea generation so far you can deliberately break this assumption and new ideas will come forward and present themselves. List 5 assumptions present in the question or in the list of ideas. Take the opposite of each assumption. Imagine new solutions that run opposite to the initial assumptions. Add these to your list of ideas. You ask the group to identify any patterns or assumptions that are built into either the challenge or list of ideas they’ve generated so far. Then you ask them to take the opposite view (i.e. break that assumption) and come up with any new solutions and add them to your list of ideas. Also a second stage technique after ABC Avalanche giving you and your group extra ‘access points’ from which to consider the challenge and generate more ideas. This technique will generate a long list of associated keywords that can be used to generate even more ideas related to the original challenge. Write down a keyword about the challenge in the centre of the flower and four words that are associated with the keyword around it (see template on next page). Write around this keyword four associations. Then follow each of the 4 words in turn up its branch writing associated keywords as you go. Then use all these words to think in a new way about your challenge and generate even more ideas. Make the list of ideas as large as possible. Another way to create new ‘access points’ from which to generate new ideas. Focus on an interesting object, picture or an article in a newspaper. Write down your thoughts, reactions, impressions and observations. Make connections to the central topic and write these down as new ideas. Repeat this several times and expand your list of ideas. You could bring a deck of pictures with you, or a set of magazines, or even ask the participants to bring their own magazines so they’re an integral part of the process. Use the 8 words from the acronym to approach the challenge from a different angle and generate a larger list of creative ideas. SCAMPER is the summary of 72 questions used by Alex Osborn who is the man that founded the concept of brainstorming in the early 40s. There’s no need to do all these words. Let them go wherever they want to go to create more productive access points to tackle the original challenge. Sometimes people are using this technique as biomimicry. Your question to the group: what kind of animals are you thinking about when you use your imagination? Get them to list lots of animals quickly and ask them to select one. What is it that makes this an extraordinary animal? Once you have that list of characteristics about the animal use those words as access points to generate more ideas about the challenge. What you’re doing here is using the beauty of nature and bringing that connection back to the challenge. List several names of animals. Choose a special animal with no link to the problem. List 10 characteristics about this animal. Use each characteristic as a stimulus for new ideas. Make a force-to-fit to the problem and boost your list of ideas. Next step is to select ideas through a process of prioritization that you want to go deeper into and do further work on to develop them further. Using a combination of dots (or hits as Erik calls them) and his COCD box you’re looking to boil down your grand list of ideas down to about 15 really good ones (5 in each color – blue, red and yellow). 5-15 IDEAS: everybody selects his or her 1-3 favorite hits; make out of these a top 3. 15-40 IDEAS: 5 sparkling ideas per person; focus on these and define an overall top 5 using dots or hits. >40 IDEAS: select individually 5-8 blue-red-yellow ideas (COCD-box); define the BIG 5 in each color. Once you have 5 good ideas in each of the coloured boxes look for themes across them to try and boil everything down to a Top 5 by making some smart combinations. If you’re looking for breakthrough ideas (and most often you will be) the ideas in the red box will be the ones you want to focus on in the next stage. What you’re looking to do now is enrich your ideas into concepts. You do this by combining your headline ideas with other ideas that are closely related from your overall list. Take each red idea in turn and see if you can bundle in other ideas from the grand list. Focus on the selected ideas. Take one idea and add on different ideas (with and without dots) from the idea list, to enrich the original idea. Do this for all the selected ideas. Give the enriched ideas an attractive title. Go on with these results. Then give the enriched ideas a more attractive title. This is one of Erik’s little gems he got out of his Master of Science in Buffalo. At this stage you’re looking to expand and test your best ideas or concepts for feasibility. Pluses: what is good, positive about the idea. Potentials: what are the possibilities if the idea were pursued. Concerns: phrase shortcomings or limitations of the idea as questions. Overcomes: generate ideas to overcome the ‘burning’ concerns. PPCO is like a SWOT analysis but in a more positive end. A moving towards approach instead of getting away approach. Facing truth and reality in a way of opportunities. Pluses: Let’s see why we should do this idea. Potentials: What are the extra potentials of this idea that you haven’t considered before? These are extra or super pluses. Overcomes: your last stage of creative thinking where you’re generating answers of how to overcome your concerns. You end with a triple positive state with very realistic backgrounds. That’s the kind of creativity you need when you have a good idea and you want to move it further whilst trying to taste a bit of the potential of it. Creative problem solving is a process that, if you have the right tools and activities at hand, you can consistently achieve fantastic results from. For your session to be a success you need to make sure you move past the first few obvious ideas, you generate tonnes of alternatives and that you postpone judgment on the quality of each idea until the appropriate moment. How does your experience stack up? Do you have any secrets you’d like to share in the comments below? Erik op ten Berg (1963) holds a Master of Science Degree in Creativity and Change Leadership, and is educated in Innovation Management at Delft Technical University in The Netherlands. 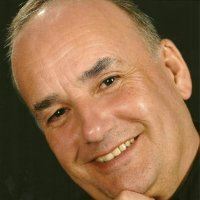 He is a well-known trainer in Creative Problem Solving, and moderator of hundreds of change focused brainstorm workshops. Besides his own company Pioen consult he is also partner at the “Center for the Development of Creative Thinking” (COCD) in Belgium. Thanks for sharing all these ideas. Very interesting and it generates a lots of ideas. One of them is the potential use of istock or getty image platform to search visuals using key words for Visual connections exercises. Wonder if you have try something like this in the past. Great idea Dany. You need to be careful of potential copyright infringements obviously but there are loads of free stock image repositories out there too you can use in the way you suggest.